We’ve officially turned over a new leaf—it’s fall. You might have your closet stocked with all of the essentials, but what about the biggest shirting trends for the new season? Read on to see the best fall shirts to stock up on. Finally, a shirt that works harder than you. Now don’t confuse this with a shirt you wear to the office. This work shirt gives you all the perks of looking like you put in the work, without even breaking a sweat. Dark jeans and a puffer vest layered on top. A white tee. Cuff the sleeves for a casual weekend look. With khakis or chinos and leather brogues for a day at the office. This year-round choice should already have a top spot in your closet (it’s an essential). You have the options of the classic blue chambray, or switch things up with a colored version (grey gets our vote). Colored chinos and underneath a classic navy blazer. Dark jeans and chukkas for a smart casual option. The real question is, what can’t you wear it with? What’s more satisfying than hitting “snooze” when your alarm goes off? Knowing you won’t be late thanks to easy-care dress shirt that you don’t have to iron. It’s ready for work and ready to go in your carry-on over the holidays. Dress pants and a coordinating blazer. Dark jeans and chukka boots take the cake on date night. Khakis, brown brogues & a matching belt. Think of this shirt as the piece that’s been missing from your closet. Comfort meets functionality here with a woven front fabric and a comfortable knit fabric for your back half and arms for extra stretch. Dark jeans and a lightweight utility jacket. Olive chinos and Chelsea boots. Jeans, sneakers and a puffer coat for a night out with the guys. It can’t really be fall if you don’t have a flannel shirt. We’ve got plenty of options to add to your closet, whether it’s a classic Christmas plaid or a solid-colored and supersoft flannel. Jeans and brown leather boots for the classic heritage look. Unbuttoned, layered over a tee and jeans. Add a leather jacket and dark jeans for a night out. Not to be confused with your chambray shirt—the denim shirt adds the man to manly. With a thicker fabric, it’s great for cooler weather and ideal for a work to weekend ensemble. Layer a crew neck sweater on top if you’re wearing on to the office. If you’re going denim-on-denim, choose a different jean wash to mix things up. Oxfords have a special place in every man’s heart. Add stretch to them and you’ve got your new favorite button-down. Distressed jeans and a pair of Chelsea boots. Layered underneath cardigan with dark jeans. Dress pants and dress shoes for the holiday office party. This sturdy option is a great way to add different textures to your wardrobe. Not to mention it’s a fan favorite in colder climates. A brushed twill version is dapper enough for the office with a pair of khakis. Dark brown chinos and work boots. 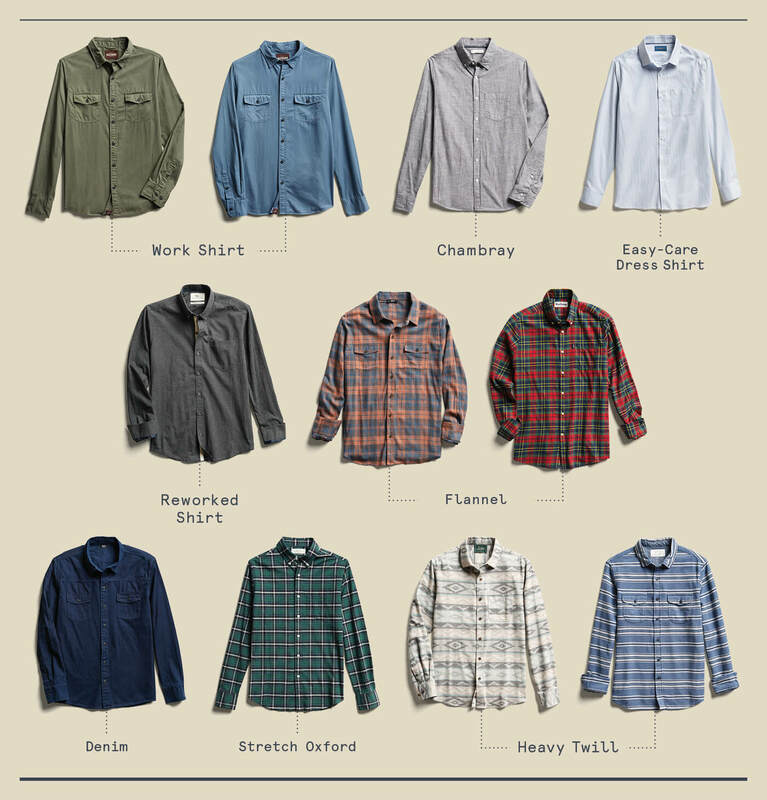 Need a new shirt (or two) for fall? Get these shirts (or ones like it) at your doorstep.